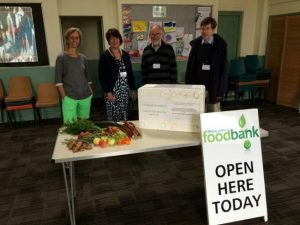 In the summer of 2015, Fizzypig teamed up with allotmenteers from Wotton-under-Edge to create an initiative to supply the local Foodbank with fresh produce. Local allotment holder, Steve Todd came up with the idea. Noticing that he and many of his fellow allotmenteers were growing more produce than they could use, he wondered if it would be possible to join together and donate surplus fruit and vegetables to the Foodbank. Wotton Town Council helped to promote the idea to local allotment holders. Collection boxes were placed at the Knapp Road, New Road and Coombe allotments and, each week during the summer and autumn, these were filled with generous donations of rhubarb, plums, courgettes, herbs, potatoes, beans and lots more. People with excess produce from their gardens also donated via these boxes. You can read an article from the Gazette about this project here.